In the next few months, Sting will celebrate his 25th anniversary as a solo artist (and his 60th birthday) with a new box set and theater tour. The biggest party, though, will be the October 1st benefit he's throwing for the Robin Hood Foundation in New York, where he'll be joined by Bruce Springsteen, Lady Gaga, Billy Joel and many more. For Sting, the show is both a celebration and chance to give back. Rolling Stone spoke with him backstage at the iHeartRadio festival last weekend about fame, looking back, current music and the relationships in his life as he turns 60. You just released the box set, which meant a fair amount of revisiting your past. I was kind of forced to look back, and I was kind of pleasantly surprised by what I heard. I thought the younger me made some reasonable musical decisions, there's a reasonable level of musical sophistication and harmonic knowledge displayed. Were there any tracks in particular that stood out to you? What we did was we remixed a lot of stuff. It's a bit like archaeology, we found little things that got buried in the mix, saxophone parts by Branford Marsalis. It's like digging up artifacts and dusting them off and making them shiny. So the record sounds kind of fresh and new, which is interesting. And then you're also coming back to smaller venues on this upcoming tour. I like to keep that muscle flexible to play big stadiums, gigantic gigs, or clubs now and then – to walk into a pub and stand up and sing. It's a different kind of muscle, but it's an important one. The song should still carry, even in a small place. It gives you the chance to show an audience you're a real human being; you still sweat, you make mistakes, you fumble. In a big stadium everything's just magnified to the extent where you can't make a mistake, everything's just covered for you. But that close up everything's kind of human, which I like. Certainly when you take the songs into the smaller setting like that they can change as well. So are there any songs you're excited to revisit? We're sort of looking at what the set list will be, but it's an odd little group. It's gonna be two guitars, two violins, vocal and bass. I don't really know what that sounds like, but I'm fond of taking the playing cards and throwing them in the air and seeing where they land. So that's it, that's our band. I have no idea what it's going to sound like. The October 1st New York benefit show for the Robin Hood Foundation has a stellar lineup, including Lady Gaga and will.i.Am, who were both here this weekend. Do you keep up with a lot of artists? I know the broad strokes of what's going on. I don't know the minutia of what's happening in pop. I listen to music essentially to learn something and if I'm not learning something, I tend to give it a cursory look. But Gaga I appreciate a lot because I think she's a musician, she can sing, she has an amazing integrated concept of what it means to be a pop star. She's kind of evolved from where we were into this 24/7 thing and I'm fascinated by that. You kind of have to do that now, though, because it never shuts down. Yeah, well, I discussed that with Gaga yesterday. I said, "Are you going to go out tonight?" She said, "I can't go out because people just don't leave me alone." I said, "At some point you're going to have to demand citizen's rights. You have a right to life like everybody else does." She seems to be coping. I need to be a citizen, I need to walk around the streets unmolested without a bodyguard or all that nonsense. I tend to live a normal life. Were you able to manage that though when the Police were at the height of popularity? I've never taken myself all that seriously as a celebrity. I was a father, I have children, I was married, I paid taxes, I actually had a job before this one, I'm a citizen and I vote. So I led an adult life and that's what I revert to when I'm not on stage. Did turning 60 this year lend itself to all the looking back or was it the 25-year anniversary? Both things coincided at the same time, so we thought it was a good time to reflect. For me, getting older enriches life. You realize there are a limited number of summers left or winters or tours or songs or relationships, so you have to really value those to the extent you want the full potential for all of them. I feel healthy and happy, and have a good relationship with just about everybody in my life. Since there are, as you put it, limited summers, where do you want to go next musically after you finish all this nostalgia? Everything I do is an attempt to create a little more space for myself and more freedom for me to be comfortable in, so that I can get uncomfortable in a new one. I'm not sure what I do next after this next tour. I'm just full of wonder and a sense of joy and the same kind of childlike love of music I've always had. There's so much to learn and so little time. I first seen sting back in 78 in Edinburgh and have been a fan ever since ,my long time wife (25 years)says sting could sing the bible and i,d probably buy it .....she,s right ,Happy birthday Sting i,m 50 on nov 2nd so i,m catching up with you,never stop singing and i,ll never stop listening. :)All the best Monty in Oz. from kitty 4 in NY!! 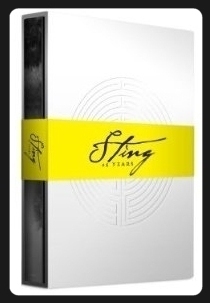 During this whole 25 years celebration...we too have been looking back,browsing our catalog of Sting/Police music. It has been quite a journey, with our dear friend Sting. Re-listening to each and every album during these weeks has flooded my mind with memories. Memories of growing up,school, moving out,struggling with relationships,being joyful,falling in love, rocking my children, dancing with my husband,...This has been a time for reflection for me as well. A happy time,a lovely life, tied together with Stings lyrics and music enriching each moment. Good morning...I was happy to read this interview, thanks. Every once in a while I pull out Sting's books (Broken Music and Lyrics) and have another glance through his thoughts as he has written them over the years...It's like having an old friend that speaks out, but the meanings of the thoughts and songs change for me over time. I love to see you as the "bindings crack and the pages start to yellow..." I'm still in love with you...All the best and many, many more beautiful years to you and Trudie, Sting. Happy Birthday. Sting didnt mention a drummer when describing the band for his tour. Was that an oversight or will Vinny Colliutta be there as stated in a previous article on this site? The Theater tour of Back To Bass: so looking forward to this performance. Thank You Sting. Happy Birthday, Sting!